After days of managing my risk exposure, I finally bit the bullet on my NZD/USD trade! It didn’t go as well as I had expected though. Instead of rising to the mid-range resistance at .8200 as we had predicted, the Kiwi was dragged down by interest rate cut speculations in Australia and risk aversion in markets. If you remember, Australia is one of New Zealand’s largest trading partners. 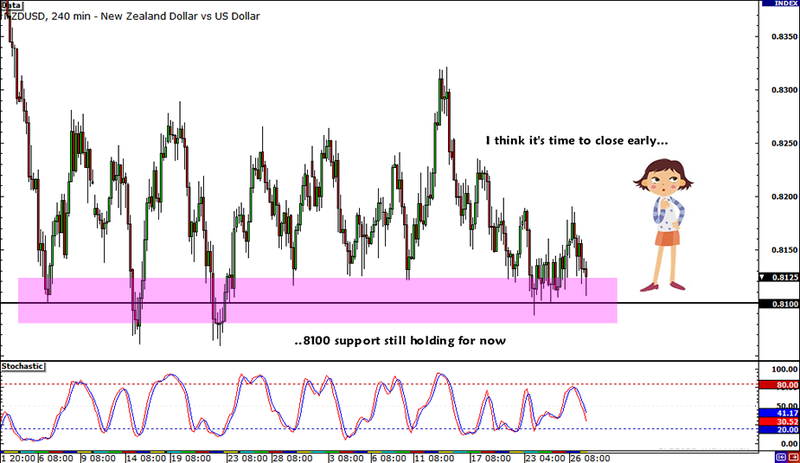 NZD/USD ended up testing the .8100 support a couple of times in the past week after encountering a strong resistance at the WO level that I pointed out in this week’s Comdoll Trading Kit. This time around I decided to just close the rest of my position since New Zealand’s trade balance and building consent reports will be released late Sunday night. I think the trade idea wasn’t too bad at the time, but the price action just wasn’t what I expected it to be. As Dr. Pipslow often reminds us, it’s always a good idea to follow the trading plan. And I did mention in my journal that I wouldn’t keep open positions over weekends. 1st position: Bought at .8125, closed at .8131 prior to FOMC and RBNZ statement. 2nd position: Bought at .8160, closed at .8182 before the end of the week. Do you think I did the right thing? Some of my friends are telling me that I should’ve held on to my trade, but I’m not so sure. Any tips for my next trade? Despite the action-packed economic schedule for the past few hours, NZD/USD‘s support level still seems to be holdin’ like a boss and my trade is in the black! To take the extra volatility and risk into account, I made a few adjustments with my open trade. For one thing, I decided to tone down my risk prior to the FOMC statement and the RBNZ rate decision. Instead of keeping 0.5% of my account on the line during these events, I decided to close the first half of my position (.8125 entry) just a bit above breakeven. With that, I managed to lock in a couple of pips and a teensy 0.02% gain. Hey, a gain is still a gain, right? I’m keeping the rest of my position (.8160) open but I adjusted my stop a bit higher so that I could jump out of the trade in case the range breaks during the FOMC or RBNZ statements. Fortunately, the .8100 handle was strong enough to weather all that volatility! I’ll be holding on to this trade until the end of the week, and hopefully risk appetite gains traction by then. May the odds be ever in my trade’s favor! Looks like the support area that we saw last week is holding like a boss! As you can see on the chart below, NZD/USD benefitted from the risk appetite last Friday when rumors circulated that the G20 economies would cough up at least 400 billion USD in new IMF funding to better safeguard the euro zone from debt contagion. In fact, the pair even went above my second order at .8160! Unfortunately, the comdolls failed to sustain its gains as they started the week on the wrong foot. Worse-than-expected economic data from Australia and China, as well as political and economic concerns in the euro region weighed on risk appetite and dragged NZD/USD below the .8125 support for a while. Will the better-than-expected visitor arrivals and credit card spending reports be enough to bring NZD/USD back to the top of the mid-term range? A couple of hours ago New Zealand’s visitor arrivals came in at 2.3% in March after printing a 4.8% decline in February. In addition, the country’s credit card spending rose by 5.2% compared to March 2011, which is a bit better than the 4.0% growth we saw in February. Taking all these mixed signals in to consideration, should I keep my orders open, or should I close my trade before the FOMC minutes? Right now I’m leaning towards keeping my trade open since the support level is still valid, but I also don’t know how much risk aversion is going to influence the comdolls in the next couple of hours. What do you think? 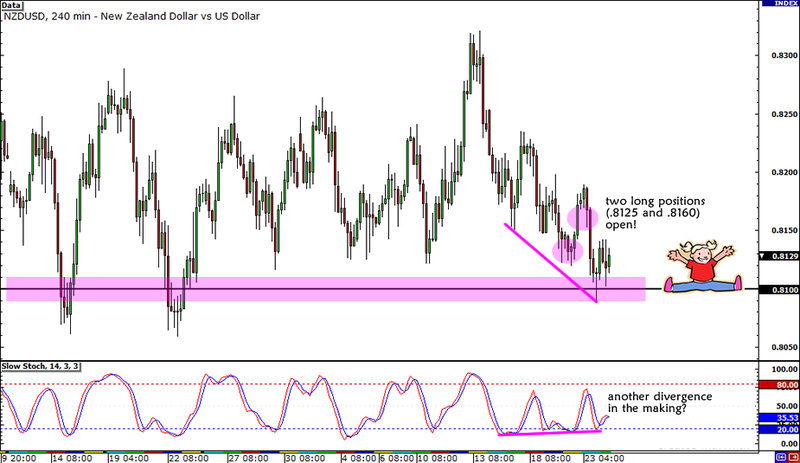 It looks like NZD/USD is presenting another range play as the pair is approaching a significant support level. Despite my wipe out from last week’s short NZD/USD trade, I’m not giving up on this pair but I am switching sides! 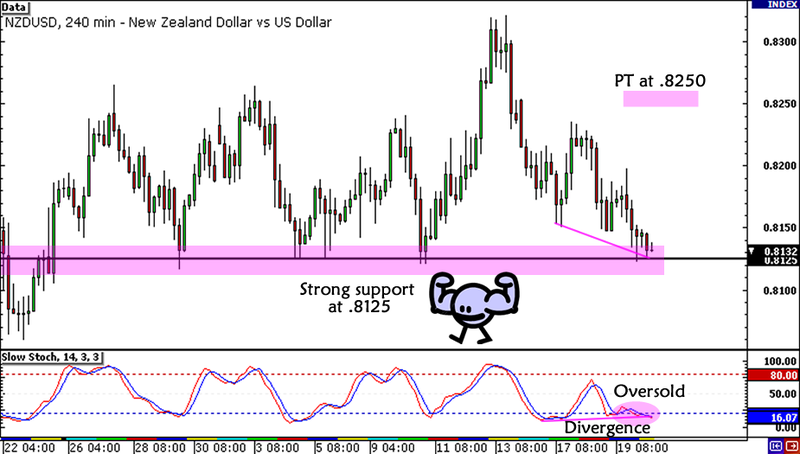 Big Pippin pointed out the bullish divergence forming on the pair’s 4-hour time frame as NZD/USD made lower lows while stochastic made higher lows. However, I’ll be exercising an extra dose of patience as I’ll check whether it meets the 9 Rules for Trading Divergences before playing this setup. For now, it looks like risk is still on as traders found new hope from the BOE’s recently released meeting minutes, which turned out way more hawkish than expected. Add to that the fact that the IMF and G20 will have their meetings over the weekend and possibly come up with contingency plans for the euro zone. I’ll be extra cautious on this one though, as I’m still hurting from my recent loss. I plan to move my stops before the end of the week or cancel my open orders if they don’t get triggered by then, in case the pair makes a huge gap before the markets open on Monday. Also, I’ll be scaling in by putting one entry at the very bottom of the range and another entry to catch the momentum if it breaks above .8150. 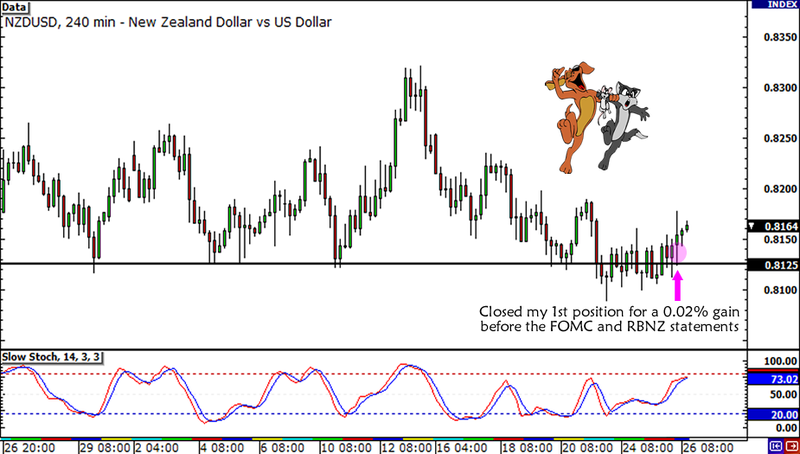 I’ll be widening my stop a bit too – I’ve learned my lesson from that NZD/USD spike above .8300 last week! Long NZD/USD at .8125 and .8160, stop loss at .8040, PT at .8250. I’ll be risking 0.25% of my account on each position and if you plan to take this trade with me, make sure you read our risk disclosure first! Will this give me a chance to grab some last-minute pips before the end of the week? Let me know what you think!